Passionate? Yes, that's me. Opinionated? Absolutely. Stubborn? A donkey has nothing on me. 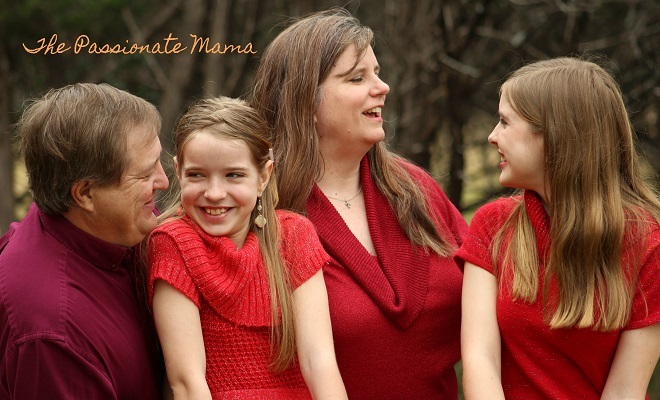 With all the passion I can muster, I love God with all my heart and I love and care deeply for my family - my husband, three grown children, from whom we are blessed with five precious grandchildren, and two young daughters at home. I give my family my opinions whether they want them or not and am stubbornly committed to giving them the best I can. I worked in the computer industry from the time I was 19, starting with main frames and moving to PCs. That was the time I discovered that I was a geek, and I'm proud of it. :-) That was about 25 years ago. I thoroughly enjoy computers. The thing is, I love my family more and will sacrifice whatever I need to for their sakes to ensure that they have every opportunity for success. I homeschool my children and have done so since 2004, beginning when our younger son was in 8th grade. Our faith in God is the cornerstone of our lives. It is what we base what we do, why we do it, and how we go about it. It is paramount in our daily lives in rearing our children. My husband's family has a history of coronary disease that I help my husband treat through diet. Our older daughter has food allergies that require a special diet. We have learned about homesteading, emergency preparedness for our family. In recent years, I've learned a great deal about helping care for elderly parents. I hope to share some of what I've learned to help you help your family - and yourself. Through the past several years, we've learned a great deal about homesteading and emergency preparedness - and some pitfalls to avoid. I will be sharing these tips with you. These are some of the topics I hope to share with you. and hopefully bless and encourage you along the way. If you have questions about a specific topic or would like to know more about a topic, or would like to join the email list, please reach out using the Get In Touch form. I look forward to hearing from you. Note: Please no unsolicited offers, sales, or promotions. Someone else who remembers core memory! I love it!